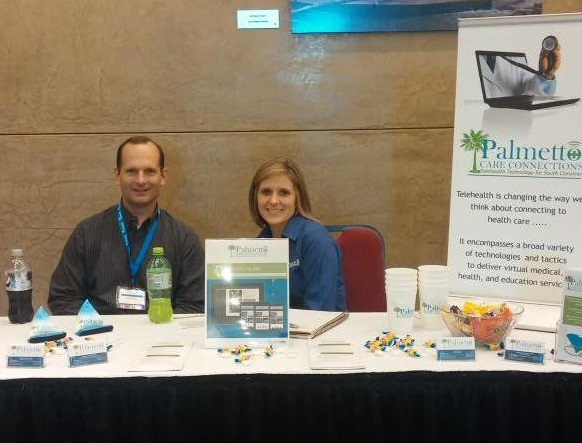 Palmetto Care Connections at last year’s Annual Telehealth Summit of South Carolina. PCC conducts the summit each year for providers across the state. Palmetto Care Connections’ (PCC) mission is to facilitate health care access across South Carolina through the utilization of innovative technology to promote the provision of qualified medical professionals of various disciplines. Palmetto Care Connections’ vision is to improve the health of South Carolina through telemedicine. Kathy Schwarting, executive director of Palmetto Care Connections, was interviewed by NCHN’s director of member services to share information on the network’s characteristics, key learnings, accomplishments, and challenges. A: We are a statewide telehealth network for South Carolina. We are neutral and non-biased. We work with all providers to care for rural patients. A: Education and the expansion of providers. The network provides a large amount of education to rural and hub providers on the topics of broadband and telehealth. Many providers are unaware of the bandwidth requirements necessary to operate telehealth equipment. Oftentimes facilities do not have the proper connection capacity, specifically bandwidth, to participate in telehealth services. The network assists these providers in understanding the technological needs and the benefit to providers and patients in investing in telehealth. With the proper technology in place, facilities can move forward with the installation of telehealth equipment, which provides access to an expanded pool of specialty providers. This results in better and more-timely care for patients. In order for us to be successful and viable, we need to meet the needs of providers as well as patients. We are unique in that we educate patients and providers. Our market area is the entire state of South Carolina. We perform needs assessments to locate target areas where telehealth is not presently being utilized. One strong and motivating evidence of success to share with network members as well as potential members is the network’s 95% patient satisfaction rating. We are trying to work with more critical access hospitals and rural health clinics. We are trying to reach small, rural providers. A: Obtaining access to care, provider education needs, obtaining equipment, demonstrating the need and value of telehealth, and making telehealth an everyday part of providers’ work flow are challenges. PCC is currently tackling all of these challenges simultaneously, something that could not be done by a single entity. It requires the collaboration and cooperation of the numerous network partners that make up PCC to address these various challenges. The satisfaction of helping those patients is an advantage. We can truly impact patients’ lives by incorporating telehealth. You can see the results. A: We are on the road to sustainability. I have had experience in creating a sustainable network and knowing the need to identify resources for support. Obtaining and maintaining the business financially is the only way for the network to continue to help rural providers and communities. We have provided income-related services since 2010 and obtained a HRSA Network Development grant in 2014. We are having success and making steps toward sustainability. Q: Based on your experience as a network leader, what advice do you have for a developing rural health network? A: Building trust and establishing relationships is key. Make the time to identify and build needed relationships. Create relationships among members and partners and find ways to show them you can do better together. Be patient. Don’t go for gusto. Find small successes and grow into larger ones.